＊Toda I, Fujishima H, Tsubota K. Ocular fatigue is the major symptom of dry eye. Acta Ophthalmologica 1993; 71:347-352. 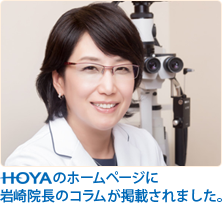 ＊Shimmura S, Shimazaki J, Tsubota K. Results of a population-based questionnaire on the symptoms and lifestyles associated with dry eye. Cornea 1999; 18: 408-411.
medications. Survey of Ophthalmology 1979; 24: 57-88. ＊Burnstein NL. Corneal cytotoxicity of topically applied drugs, vehiclesand preservatives. Survey of Ophthalmology 1980; 25: 15-30. ＊渡邊潔. 洗眼液の角膜上皮に及ぼす影響. 眼紀　2000; 51：32-36. ＊Balaram M, Schaumberg DA, Dana MR. Efficacy and tolerability outcomes after punctal occulusion with silicone plugs in dry eye syndrome. Am J Ophthalmol 2001; 131: 30-6. ＊Tsubota K, Goto E, Fujita H, Ono M, Inoue H, Saito I, Shimmura S. Treatment of dry eye by autologus serum application in Sjogren`s syndrome. Br J Ophthalmol. 1999; 83: 390-395. ＊Shimazaki J, Sakata M, Tsubota K. Ocular surface changes and discomfort in patients with Meibomian gland dysfunction . Arch Ophthalmol 1995;113:1266-1270. ＊Toda I, Shimazaki J, Tsubota K. Dry eye with only decreased tear break-up time is sometimes associated with allergic conjunctivitis. Ophthalmology 1995; 102: 302-309. ＊ Tsubota K, Toda I, Nakamori K. Poor illumination. VDTs and desiccated eyes. Lancet 1996; 347: 768-769.